Ban the energy monsters and vampires in your house from the comfort of your living room: know what is eating your cash! Having tested a number of clip-on energy meters, I came down in favour of the Efergy Elite. 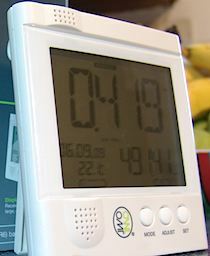 WARNING: if you have a (UK) smart meter then don't buy a clip-on meter. Your "In Home Display" (IHD) should do what a clip-on does, and more accurately. See photos of them being tested. These devices give you a fair idea of how much power your whole house is sucking from the grid, live. Studies suggest that just seeing what is being used when, helps save 10% to 20%. (Just as the Efergy 'energy saving guide' claims.) See how much juice you normally consume. Then how much that drops when you turn stuff off at the wall. See the savings from turning lights off when there's enough daylight. See real pounds and pence, on the display in front of you! The style of "clip-on" meter being reviewed here is quick and easy to install. (A sensor simply needs to be clipped onto the main power wire at your meter.) But it does not give very accurate numbers. Nor does it help you pick out the power consumption of individual appliances. Both wireless meters were easy to set up and install. Amazingly both seem to work well even with the door shut on our metal meter box, with the transmitters inside. Nor do they interfere with one another. The monitors have a similar resolution. (Elite is 10W, Smartpower is 5W.) They seemed to agree closely with one another most of the time. For example one read 260W, and the other 270W. The sleek black npower monitor display needs to be plugged in. That prevents keeping an eye on it while walking round the house. (Eg turning things on and off to see what happens.) But it has a slightly prettier graphical display than the Efergy. The chunky rubbery Efergy display is small enough to slip into a (big) pocket and has a decent green backlight. So I was able to check at night that we were down to 50W or so. Annoyingly sometimes I could not get the Efergy backlight to work when needed. It's set to only work between certain hours. I did the initial set-up in the evening where everything behaved as expected. But in the day, when our solar PV grid-tie system started generating/exporting, things went a little wrong. By their basic design these monitors are not capable of handling export from local microgeneration. Instead they see it as a load, ie consumption. As soon as the PV was generating 20W--200W both monitors showed a high load, with the phantom load rising as the export did. It was ~450W on the Efergy and ~495W on the npower. 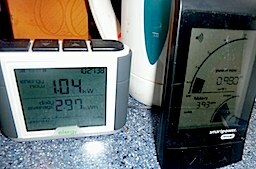 Switching on a 1kW load such as our toaster or travel kettle had the display change from ~450W to ~1150W on the Efergy. Not only can the meters not tell which way the power is flowing. Something about the shape of the PV generation also confuses them. None of this is a critisism of this style of clip-on meter. It is just an inherent limitation of this design. These clip-on meters have problems with non-resistive loads. Also with varying mains voltage, which they cannot track. Both monitors require batteries for the sensor/transmitter. The Elite requires a further set for its mobile display. The Elite recommends rechargeables throughout. Disappointingly the Smartpower insists on disposables, thus contributing to waste when it exists in order to reduce waste. The Elite also allows the transmission rate from the sensor to be reduced. Presumably to reduce power consumption and prolong battery life. Also good. 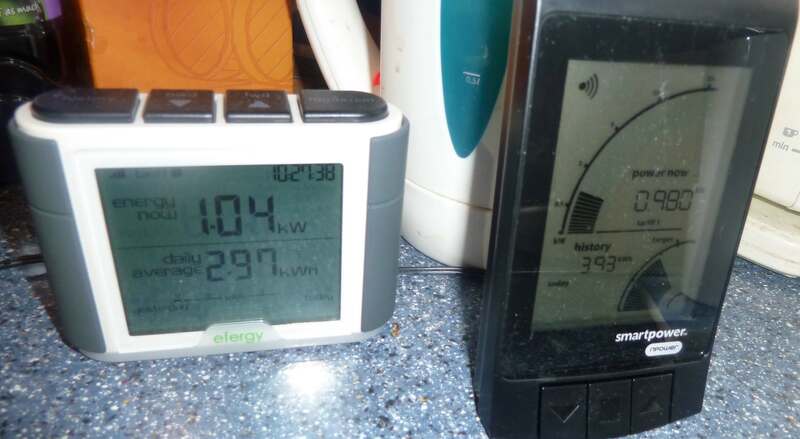 My partner found the meters easy enough to use, eg to spot the reading rise when the kettle was on. The Efergy Elite was easiest. She's not convinced that she'd use it all the time. But then we've already ruthlessly measured and trimmed and conserved! In late 2011, ie a few months after testing the Efergy and Npower/GEO devices, I had the opportunity test the Web-connected AlertMe system, and another stand-alone Owl monitor. The Owl seems to want entirely alkaline batteries (no rechargables) which is a shame. 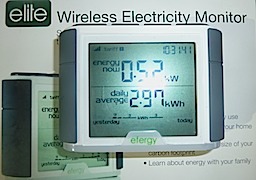 The clip-on meter and transmitter are lighter than that for AlertMe, more like the Efergy and Npower/GEO. The display unit is big and clear (and monochrome) and entirely portable, ie no mains required though there is a socket to plug in a mains adapter. The power/cost is shown in super-large digits, readable across a room, with smaller cumulative and time/date/temperature readings below. The whole-house consumption shown by the Owl fairly closely tracks that shown by the AlertMe. (Though both are badly wrong when our solar PV is generating.) Resolution is 1W. That is somewhat misleading, given that clip-on meters can easily be a factor or 2 or 3 out on some loads. But the layout of the display avoids the need for any mental arithmetic! The controls (buttons, menus, etc) are reasonably easy to use. Indeed, they're easy to guess without looking at the instruction booklet! The Owl seems not to have a backlight, which is a slight disadvantage. Unlike the Efergy and Npower/GEO, the Owl is able to work on 3-phase systems. (Two more clip-on meter/transmitters would be needed, I think.) The AlertMe system could accept inputs from three clamps. But I don't believe that its software would do the right thing. I prefer the Efergy Elite. Portability, backlight, and use of rechargeables throughout are a win. Thanks to Vicki G for lending me her Efergy meter for testing! Clip-on (current clamp) electricity monitors are not accurate. First published 2011-02-18 , updated 2019-04-22 . Site copyright © 2007-2019 Damon Hart-Davis. Hosted by ExNet.